Ty for the 4 Mesmer per game PvP meta... it is highly enjoyable. I can see you are hurting for software development for your game. Please accept this code, free of charge. All that I ask is that you integrate it immediately. We must be getting drastically different team comps because there's only been one mesmer per team when I've been playing. Maybe he was looking at clones or phantasms? I uncommonly see a Mirage in my games. More scourges and spellbreakers with a few FB's, however lets talk about mirage instead. Edit: 14 games in now and most team comps look like this. It's a temporary fix. You should improve your code man! Players voted against character locking in PvP. So basically we can only blame ourselves, not anet about how trash PvP is because of profession stacking. Since when do they ever listen or take advice from players? That is, unless it's 5-6 months later. Balance shouldn't take this long, imo. Other companies roll out regular balance patches that shift the meta or freshen things up for players to adapt to. I don't feel like their designers are up to par of their gw1 devs. That's just me though. Maybe they're newbies. Anet also provides regular balance patches. What you try to complain about is that you think they should do this more often. GW1 is funny example because this game was balance mess. Too many skills and with Factions even some could be duplicated on the skillbar, something unimaginable in a serious competitive game. 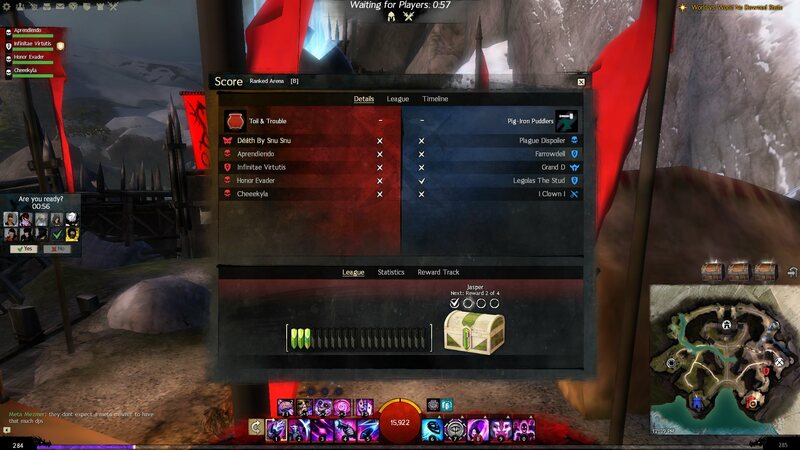 Balance is made by 3 people in GW2, for all game modes. Let it sink. I personally do not feel like 5 months is regular. If it happens around 5 months every time, it is regular. If it was once a year, it would be regular. If it was once every 5 years, it would be regular. scheduled per 5 months is regular, technically, but it's not nor should be the standard. So again, what you try to argue is that you don't like it takes so long, but saying balance patches are not regular in GW2 is false information. Correct. Glad you took 4 posts to figure it out. I did it in first post but you tried to argue with me and in the process I educated you why you are wrong. On a serious note, can we get some documentation on how 1 billion clones affect servers? wait.. there's a new season? lol Who knew? If you'd like to be technical, I'll gladly educate you on the two definitions of the word "regular" so that you will see your folly. In the context which I used it, regular = frequently. The way you argued it was "happening with the same space of time elapsed". If you're interested shoot me a message we can argue more about words and context. Attempt at superiority and witty banter failed. 15 yard penalty. Still first Down. **Anet also provides regular balance patches. **What you try to complain about is that you think they should do this more often. GW1 is funny example because this game was balance mess. Too many skills and with Factions even some could be duplicated on the skillbar, something unimaginable in a serious competitive game. kitten, but also quality > quantity even if they were balancing constantly (see BDO for example). Breaking something and not balancing for 4-5 months is not regular balance patching. Wasn't even a top 250 last season. Let that sink in. Sorry, stop white knighting the pvp decisions from this company. Yeah I know alot of people who are regular pvpers refusing to que this season until mirage is put in check. The rest of my friends are, well, playing mirage. Shield of Wrath: Reduced the cooldown of this skill from 36 seconds to 35 seconds. I'm not judging whether their patches are good or bad. If you read again, which you should be able to do considering it's PEGI 12 game, I took my time to educate a fellow player that they do indeed release regular balance patches. Whether you think they should happen more often is a different story. Sorry I can't see your post with all these 78 phantasms around it. WoW and LoL have way more to consider in balance than GW2. OW you could argue has more as well as they not only have to balance heroes, but also maps if choke points become too heavy. I'm waiting on the trial of duo queue to come to an end, after that I'll be happy to vote yes to more projects to work on. Till then, every poll that comes out with options such as class specific MMR is going to get a fat no from me. It's a trust thing, I don't want Class specific MMR to be released, fail and be left alone like duo queue trial was. Players are waiting on the trial of duo queue to come to an end before trusting Anet to handle the next thing such as class specific mmr and to be frank, I'm happy I voted against it otherwise just like the trial of duo queue, it would be left half done and not completed properly. What isn't left half done in this game? Whether they like it or not, I think they've made it their own Motto to never finish, drop support for, or completely give up on ideas. I love the idea of class specific MMR but after the the fails of the year of ascension, multiple WvW overhauls and the trial of duo queue, I just don't trust Anet to fully deliver anymore. Don't get me wrong, I still love the game and respect the devs for the game they made, but too much bad PR has left a salty taste in my mouth. As I said before, the question if current release schedule is enough is a matter of your personal opinion. The fact is, however, that Anet balance patches are regular. They happen in similar time periods. If they would be once a year or once every 5 years, they still would be regular. Well then, I hope you don't complain about 4 mesmer/scourges matches. What does balance have to do with class specific MMR? I think preventing profession stacking would improve match quality. It would be possible to allow not more than one active profession per team even without character lock. It just requires more effort to implement if you not lock characters pre match. If profession stacking wasn't allowed balance would be easier to achieve. If you don't character lock people would swap just like they do today. So now this is about profession stacking? That's what my comments are about. You derailed into MMR. So because I replied to your comment with something specific as an example as to why I won't vote yes to further polls you desire, it means derailment? I'll reword my OP to make it easier to understand if that's the issue here..
"It's a trust thing, I don't want [Insert new half baked idea here] to be released, fail and be left alone like duo queue trial was." If somebody tries to switch character pre match to a proffesion already in team the same could happen that happens now when switching character after match has started. It would also be easy to not allow queuing together with same profession. It will be still possible to change to a proffesion not in team pre match but proffesion stacking would be gone. It is just a question of doing those modifications to the current system. Remember the bad ol' days of esports and class stacking was taken out of the equation? Someone here will remember the stunt pulled of a team going in all on one class to prove the point of how bad it was for matchups. And yeah, still waiting for that to flow through to ranked. Quad mes is pretty bad comp unless 2 chrono and 2 mirage, I know people got salty about non elites on their team, but in a meta where a few cores perform fine I think it's healthier to display what is being run. Double mes + double rev is much more viable and much more difficult to contend with than 4 mes imo. Really I don't care how strong something is so long as there is 1 of that build and only 1 to deal with. Like when 5 Celestial ele randoms beat abjured?